My guest room had a light switch, but no light. I hated it because any time I had to go in there at night I would flick the switch and nothing happened. After THREE years I still did that. Redonk. I decided one day to buy a fabulous flush mount light and hire someone to install it. I only paid $88 for it, by the way...holy price increase, CSN! When it came in the mail, I stared at the ominous light cover thingy and decided to just go ahead and do it myself. I'm cheap, and I'm definitely no stranger to installing lighting. ...and cloth wrapped wires in a very small light box. I didn't know if the new light would fit on the old mounting strap, but I decided to just make it work. Midway, I threw on the power to make sure it would light before I went through all the work to put it up. Success! Ten swear-inducing minutes (or 40, whatever) we had figured out how to get the screws to line up on the old strap. And shortly thereafter, it was mounted safely to the ceiling. I lined up all the parts to the light shade and dutifully read the instructions. The diffuser and sides of the shade were frosted glass, so they were kind of hard to fit in there, and didn't fully line up. Oh well, I put this joint facing the window! Gotta love that sweet circle pattern! Here she is all finished. Ah, I love having a light - even if it's a little small and not that 'exciting' in the room. Our upstairs ceilings are only 7.5 feet, another charming feature of our 1937 home. We only have dangly lights when there are things placed underneath like a bed, etc...to prevent "light crashing." I think I found the best flush mount under $100, and it lights up the small room nicely. Doesn't my light look very similar to this pricey Shades of Light version? Yup, it's practically identical. I'm so glad that install is over, and now I can visit my extra linens and cocktail dresses in the closets without crawling over the bed to turn on the lamp. Score! love that!!! it is simple but so chic! And sweet light fixture! Double points for saving money! The light is perfect size for the room and adds a little bling. I'd probably do the same thing and constantly flip the switch even though I knew there wasn't a light there. I still constantly hit the wrong switch in our front entrance when I'm trying to turn on the lights (either interior or exterior). Love the fixture you got too. We can only have flush mount lights upstairs too... so i'm still looking for the perfect ones for our hall, bedroom and bathroom... ughhh. You scored though! That's a beautiful light and it does look identical to the more expensive one! Props to you for doing it yourself. If I think I can't do it I just hand it to my husband and let him work it out. lol. Good deal on the fixture. We have low upstairs ceilings, too. Makes finding the right fixture a challenge. Looks great, and I"m totally impressed that you did it all on your own. Love the new light. It looks great! Don't you love when you can get the look for less? Cloth wrapped wires? That can't be to code, right? Did Boozy have a death wish? Nice work on the light - I love the diffuser and pattern on the outside - it goes so well with your comforter too! Nice! Love the light you chose. It's nice to read another person installed a light on their own without getting electrocuted - gives me hope for the day I have to try it myself! I am so jealous of your electrical skills. I know it is a fairly simple job but I am totally afraid of electrocuting myself while simultaneously burning the house down. I just paid an electrician $150 to install two fans, and I choke on that money, but I'm just too scared. Its so pretty its a perfect fit for the space. Love it! We dealt with the ceiling and antiquated wire issue at our old house and it always make light fixture selection a real challenge. 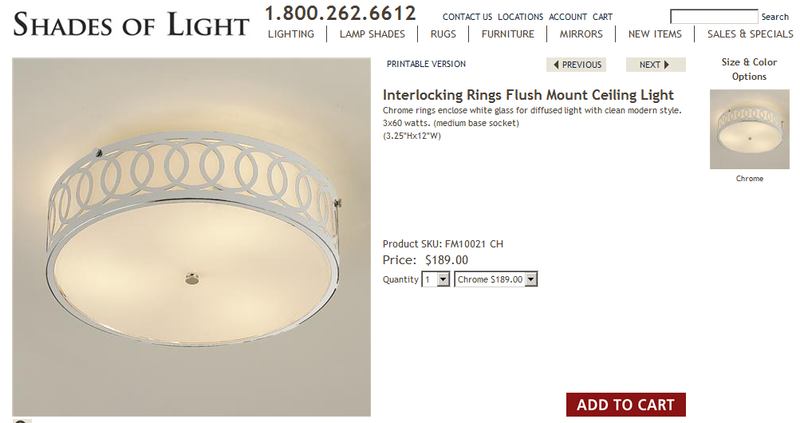 Why can't there be more stylish and cheap flush mount fixtures out there? Love what you found and it looks great in the space! LOVE the light. And three cheers for effective lighting! At some point someone patched over the light switch in our third bedroom. I can think of no logical reason someone would do that, and I really wish we had a light in there. Maybe someday I'll decide I care enough to do something about it and tear into the wall. Maybe. look at you, tapping into your inner electrician! and i can't believe you got that for eighty eight bucks! golly what a pretty fixture! i grew up in a house that was built in the 20s.. and being a 6ft tall lady, i feel the pain on low ceilings! great find! Wow, great jo on the installing AND the cheap find! I haven't had to replace a light fixture yet, but I'm pretty sure I would be intimidated by it. The light may be small, but it does make a big difference! Loving the new light fixture, in fact if you take a look at my BLOG that I posted today you will see the perfect staircase to go with it . . . see picture 1. Next to booze, I think your new light fixture is very necessary in my life. It's gorgeous!! I love that light! It is perfect size for the room and adds a little bling. Got a minute? Stain something.